Affiliate Marketing Partnership -> $16,000 in commission! 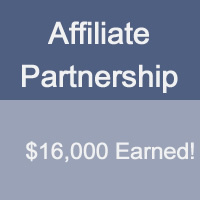 →Affiliate Marketing Partnership generates $16,000 in commission! Affiliate Marketing Partnership generates $16,000 in commission! I think Affiliate Marketing Partnership for bloggers is full of awesomeness. This is simple! Two or more bloggers coming together, trusting each other and promoting one product on the same affiliate link. What this means is more traffic, more sales and more money. I want to discuss this with you because I know it’s something that works and can help bloggers make more money with their blogs. Affiliate Partnership generates $16,000 in commission. Here’s how! There are two things required for this to succeed! 1 – > You must trust each other! Whether you are two or more (I don’t advise going beyond 3), trust must be the center of your partnership. This involves money and there is absolutely no way to control what’s earned. You will have to agree to promote a single promote from an affiliate account owned by one of you. If you are three in the partnership, you’ll have to share login access into the affiliate account. But the aching truth is that the commissions will be paid just to one of you who will now go on to share accordingly. That’s why it’s important as a blogger to position yourself where people trust you. Trust is an important business factor. Can someone blindly give you access to his/her money account and walk away in confidence and peace of mind ? Think about it for a moment…! Harleena, in her guest post on Kikolani shared some highly recommended points on becoming an ethical blogger. I sincerely believe in her points to succeed in this industry. If you want bloggers from other ends of the globe, people you’ve never made in your life, to fully trust you, you’ll have to be able to build trust by being ethical. Harsh took the risk to give out his login details to Anil and he was not disappointed. Anil is an awesome guy and one of my active community member. 2 -> Affiliate product that pays more with more sales! Affiliate marketing is a lucrative online business. Some products are positioned to reward you with more money if you put it a little more effort. The more sales you make, the more money you earn per sale. This is common in Webhosting industries. HostGator pays up to $125 per sale if you generate more sales per month. Host1Plus, in the same webhosting industry pays you more with more sales. If marketer A can generate 6 sales with HostGator a month and marketer B generates 6, that means both marketers are on $75×6 = $450 each and $900 for the two. With concerted effort, promoting the same product from a single account, 12 sales a month give both marketers $100×12 = $1200. That’s awesome, if you ask me! From every stand point, partnership works! So how do you go about Affiliate Marketing Partnership? If Affiliate Marketing is one of the ways you make money online, you may want to try this out. I’m sure you have one or two trusted friends online doing almost the same thing as you. All you have to do is share this post and give yourselves a chance. It doesn’t require any spending. You have to discuss the idea and move forward to its implementation. Still not very comfortable with Affiliate Marketing? Check out this excellent video training. Donna shared with us different ways to sell Affiliate Product on your blog. It’s important once you are into Affiliate Marketing Partnership to track sales. Why this is necessary is that it encourages partners to work hard. If by the end of month, partner A generated 7 sales while B came up with 2 sales, you may run into problems. To avoid this, you have to lay out some sharing principles – If out of 8 sales, you make 6, what does 6 represent in terms of percentage? Most of these affiliate platforms allow affiliates to create different campaigns and track sales. This helps you know which traffic source is working well. You can use the same method to create different campaigns for different partners or generate unique sales tracking ID. It’s absolutely up to you to decide how to handle the partnership and commissions sharing. In any case, everyone in the partnership wins. The trust factor is what must be thrashed out before everything else. If you have the wrong person to receive the commission, your partnership may crash. So drop a comment and let me know if this is something you think can work for you. Do you have trusted friends? Great post my friend. This is a great way to increase revenue for everyone involved. Trust is paramount here as you mentioned, but if you have a good friend or two it should not be a problem. My only piece of advice is to pick someone who may have a similar reach as you do, therefore you won’t have any squabbles over who gets what. Better yet have the percentages decided in advance based on who sells what. Fixing the percentages before any other move, I think is the way forward. Just like Harsh and Anil, knowing what who gets per sale. while this method can really do well, it’s important to get things well spelled out in the beginning. Thanks for being part of the conversation, buddy. I Agree Harsh is an awesome blogger. I also noticed that you changed the position of your comment form. Awesome post, thanks for sharing ! Affiliate marketing is a great way to go. You talk about doing business with other persona and yes, that requires truest. I’m doing something just like that as I write. Doubled with trust comes the “partnership” The two people need to both figure out the distribution of work. Once that is done, it would do no good if one of the people didn’t stand up to what is expected of them. The do need each other. So that does bind the two. Tracking sales is important to do, but if you really have trust in a partner that would do that job, great. Or maybe it is your job to do….even better! That’s right Donna! The keyword here is trust and that’s at the level of sharing the gains. Tracking will help the members know who is generating more sales so they can share the commissions accordingly. Good to know you are doing this with some partners so good luck to you all in the venture. I haven’t ventured into affilliate marketing since am pretty a newbie though I’ve heard a lot about affiliate marketing and I’ve the post “sell affiliate program on your blog” by Donna Merrill. Like you said this kind of patnership business requires trust for things to go smoothly. I agree with what Kurt said about picking someone who may have a similar reach as you do, so you won’t have any squabbles over who gets what. Even with trust one will still needs to come to terms with the pay. You’ll soon get into it. It’s a sweet way to make money online. Trust is the main word here and I think the only way to be able to assess the input of different partners is tracking sales with unique IDs. That way, you can share according to agreed. Great information. There are so many opportunities with using this strategy. Thanks for sharing your thoughts and suggestions in getting started. It was yesterday when you brought my attention to the story Harsh shared on his blog about affiliate marketing partnership. You know I have to go check that article out. It was all based on two (2) things => RISK and TRUST. In life, people who take CALCULATED RISKS go far in most cases and Harsh is one of these people. His friend Anil is also a risk taker and so the two of them had this in common. Harsh giving out his login details would have ended up losing it all, but the risk and trust factor paid out. I think this is a lesson we bloggers should learn. Being a blogger is not just enough but an ethical blogger, one which people can approach and do business with. I am happy you brought up this story Enstine. Together, we all can make the blogosphere a better place to be and make fortune! Thanks for taking the time to read and drop a comment bro. Congrats on rebranding your Blog. I’m still to come round and share what I feel about the new name and look, which are already picking up. I know both of us have gone a long way too. Remember the last time you gave your Gmail access to me? I think we can both hit this deal. All that’s left is to discuss it out and chose a product. This sounds like a great strategy. But the problem that most people have is trusting someone. This can not only end a business relationship but also a friendship. This is why it’s crucial to have a strong ethical background between two people. There has to be some some principles that will maintain the partnership so that both parties can benefit. As I was reading I was thinking about who I can partner with. This can also be an accountability partner to keep each other afloat and right on track. Thanks for sharing this idea from Harsh. Have a great weekend! Once trust is in and you’ve sound someone in your niche, it could be easier to get going. Thanks for making time to be part of this conversation buddy. This is great to read, but like everyone who voice their opinion here has said……trust is the major thing here. And like Kurt said, involving someone who is on same level with you is most important so no one feel like is putting too much than the other. Trust is the keyword here as I highlighted in the content. I also mentioned tracking as a way to know how much effort who is putting in. You must also lay out terms of sharing at the very start in order to avoid problems in the future. Very good post on affiliate marketing partnership. It sounds like a good business model and especially if the other party has more experience than the other so that one can learn more about the business in the process. yes, definitely, trust must be a factor and so one would need to work with a trusted partner. If one can overcome this, it would work and would be a good way to create waves in the market. Thanks for the post. Very correct Vinton and thanks for adding your voice. I’ve been affiliate marketing for years, and it works great if you know what you’re doing. Regarding your strategy, others have said it and I will reinforce it – trust is key. And as Kurt has said, the union between the two entities needs to be a good one. To avoid resentment and disharmony in the future, both parties need to be of like mind and at similar levels. Good to see you here this weekend and yes, trust is the keyword 😉 In addition to that, laying down sharing terms from the very beginning can help avoid some problems in the future. Yes read there strategy from http://bloggerspassion.com/, and looks like a good business plan to opt by selling web hosting and they pays good percentage a s commission. Great Strategy Man! “With concerted effort, promoting the same product from a single account, 12 sales a month give both marketers $100×12 = $1200” It can doubled our affiliate income. Hope i should try ASAP. Not only affiliate marketing but also on another analog business trust is a factor. Good to see you here and thanks for taking the time to leave a comment. No, but MyThemeShop Offers 2 tier affiliate sale with Highest 70% Commission That’s not appear on other WordPress Themes Club. I just promoting them because i am a premium member of MyThemeShop and they changed my affiliate thought and their membership affiliate is really good. You concluded well the partnership of Anil and Harsh. I have read that post on shoutmeloud in which Harsh has spoken about all the things about their successful partnership. Trust is an obvious factor in any kind of partnership. In the online world, it becomes more concerning to select a trusted guy. I have been from 4 months in blogging. I am looking to have a partner I can start the affiliate marketing with. I will take care your tips that you have pointed out here.. Affiliate partnership seems to be a good thing to check out, this is actually the first time I’m hearing the term but over all, its really very interesting. And like you mentioned in this post, the keyword here is trust and without it, the partnership will not hold and you do it with someone you do not trust, it will all be a mess. Awesome post from you as usual. One bitter truth I find worth mentioning here is that if you don’t have a good blog with good traffic, don’t expect to get a good partner. Rest everything about this strategy is awesome. Nabeel Shamshad recently posted…9 Experts believed in these SEO Myths – Do you? Second time hearing about Affiliate Partnership…First time on SML blog now on yours.Affiliate Partnership is really a unique concept from which both the partners get benefit.Its a win win situation for the partners. How can i find partners to share affiliate marketing and How can i trust the persons i just met. You’ve floated a great idea of affiliate marketing partnership and I wish you and your partners achieve success in the likeness of that proved by the partnership of Harsh and Anil. Don’t know why I’ve never heard about it, or thought about it. I’ve done affiliate marketing by myself for years. Thinking what could have been made if I partnered up with some one. But like you said, it’s pretty tough to find the right people to partner up with. That is the key. Affiliate partnership seems to be a good thing to check out. I am not sure it will work for me but going to try it soon. Blogging in parternership is good. But truth in each other is very important. I know two blogger they was best friend. But due to blogging they became enemy. I like your first point, “You must trust each other” because we can not do partnership with out trust. If we don’t trust each other then we should not action on next step. If I talking about Affiliating program, No doubt, Affiliating program is now a days a great income program. We can earn awesome money with little hard work and trust. So trust is this post is very important. Any way thanks Enstine for sharing such wonderful post with us. Hi Enstine. I have heard about high commissions when more Affiliate sales have been generated. But, when the commissions have to be split between bloggers, there will be disputes, if the sales gets generated all from one site itself.